Sunday, 31st October 2010. 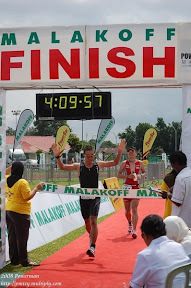 This was my first triathlon race in Miri, Sarawak. It was a very good race eventhough they changed the swim from Channel swim to Open Sea Swim which a had BIG wave. The wave was BIG !!!! Hj Osli (Hj Tukuk) with 2 minutes behind me managed to overtake me during the bike leg but I managed to overtake him during the running leg. Zaeidi the last 5 swimmers coming to T1. 7 minutes behind Hamsul, 15 minutes behind me, 18 minutes behind Ahmad Fathi and 31 minutes behind the first swimmer. Zaeidi managed to overtake Hamsul during the bike leg with total bike time of around 1:08 hours. My bike time was around 1:14 hours. I was worried Zaeidi might overtake me and I keep on looking back. 15 minutes was good enough to stay away from him. I’m really satisfied with my performance. Didn’t get beaten by Zaeidi. Had a good swim, average bike time and a very good run. My training mostly concentrated more on running since I’m doing the Kinabalu Climbathon ( which was 1 week earlier) and luckily I didn’t get injured. Running 7 days a week, swimming 3 days a week and Cycling 1 day a week. In Triathlon world, you cross the finish line not by swimming or cycling but by RUNNING to the finishing line – I read this from a Triathlon Magazine.